Even though the Pittsburgh Pirates just went through one of their most brutal stretches in recent memory, it is still too early to determine if they will be buyers or sellers at the 2016 MLB Trade Deadline. With the two Wild-Card system, more teams remain competitive longer into the summer. This results in more trades, but also can result in teams who are likely out of it to hold onto their chips longer. In the case of the 2016 Pirates, their best trade chip could be dealt in either scenario could be the steal of the trade season, should they decide to deal him. In the off chance that he remains unsigned once spring training gets underway, the Pirates should definitely consider offering him a relatively cheap one-year contract. His numbers as of late may not be up there with what he did in his heyday, but he would improve the team that Clint Hurdle puts on the field each day this summer. If we accept the common valuation of 1 WAR costs about $7 million, the signing has already paid for itself, as the 2011 World Series MVP has already put up a 1.5 WAR as per Baseball Reference. His slashline of .294/.374/.439 leaps off of the page after several down years. He has added a new position after transitioning over to first base with relative ease. It is just a matter of time before Jameson Taillon finds himself standing on the mound in a Pittsburgh Pirates uniform. For those who aren’t familiar with Taillon, it is time to get familiar. He was drafted in the first round (second overall) by the Pittsburgh Pirates in 2010. From 2011 to 2013, he shot up the organization and was on the fast track to a promotion to the big league team. Unfortunately, he was sidelined in 2014 after receiving Tommy John Surgery. Luckily for the Pirates, it looks like Taillon is back to his dominating ways since his recovery. In 2016, he has thrown 49.1 innings, with a 1.82 ERA, 51 strikeouts, and only 5 walks in Triple-A. He is ready for the big leagues, it is just a matter of finding him a spot in the rotation for him. The Pirates’ rotation is currently filled by Gerrit Cole, Francisco Liriano, Jon Niese, Jeff Locke, and Juan Nicasio. The Pittsburgh Pirates are shifting less in 2016 and their pitching is worse. Are these two related? The Pittsburgh Pirates have earned a reputation around the league of being a very analytical front office and with good reason. The team’s use of FIP and xFIP to find value starting pitching is well known, but the shift is where the Pirates really earned their stripes as a numbers-centric team. From 2013-2015, the Pirates shifted a total of 2,446 times, which was good for third in all of baseball behind only the Houston Astros and the Tampa Bay Rays, two teams with sabermetric driven front offices of their own. The 2016 season is about one month old and the Pirates shifting totals are way down from the past three seasons. They have shifted only 214 times, which is the 12th most in the league. The Pirates spent a lot of the offseason discussing their change in outfield defense by playing their outfielders a bit more shallow, but they most certainly did not mention using the shift less. What changed? Over the winter, the Pirates traded Charlie Morton to the Philadelphia Phillies and A.J. Burnett retired. These two pitchers both have ground ball percentages over 50 percent, which is why the team used the shift very heavily in their starts. In their place, the team added Juan Nicasio and Jon Niese. Both pitchers get ground balls below 50 percent of the time. The rotation hold overs of Gerrit Cole and Francisco Liriano both also have ground ball rates below 50 percent. Only Jeff Locke (51 percent) has a ground ball rate of above 50 percent. You hear Clint Hurdle talking about not trying to fit a round peg into a square hole, so it begs the question, are the Pirates shifting less because their rotation isn’t as ground ball-centric as in years past? The Pirates are generating less ground balls as a team this season, but despite that, their entire starting pitching rotation remains above the league average of 44 percent. Even though they are down with the loss of Morton and Burnett, they still are an above average team. The rules for this little experiment are simple. We cannot exceed $105 million, and our payroll has to include 28 players due to Jared Hughes, Elias Diaz, and Jung-Ho Kang starting the season on the major league disabled list. If we choose any players the Pirates did not sign, we will assume the Pirates could have signed said player(s) to the same terms. 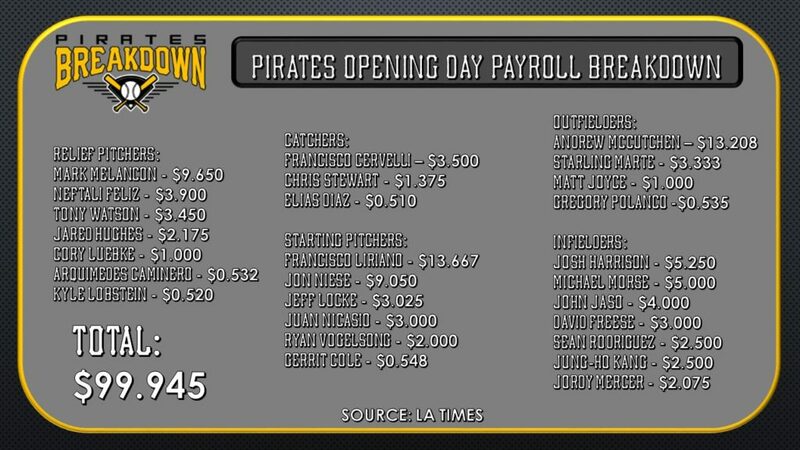 Knowing what we know now, here’s a look at what the Pirates roster could have been.